One of my co-workers recently had to eliminate pasta from his diet. When he lamented having to eat “veggie noodles” instead of the traditional spaghetti he loves, I decided to help him find new versions of noodles he would actually enjoy. Any time I’ve tried to alter eating styles or recipes for someone, I’ve learned the worst thing you can do is start with their absolute favorite dishes, since it’s most difficult to have an open mind about changing something you really truly enjoy. For that reason, I opted for a spaghetti squash recipe that provides the comforting familiarity of pasta but with a different flavor profile than his family’s spaghetti recipe. Luckily, many Southwestern dishes are naturally healthy recipes that use fresh vegetables and beans as the primary ingredients. 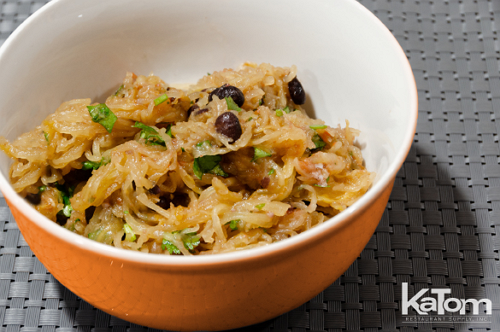 In the case of this “Santa Fe” spaghetti squash, it can be a tasty side dish or a hearty and easy vegetarian entree. The squash has a unique, slightly sweet taste to it, with a texture very similar to firm spaghetti pasta. 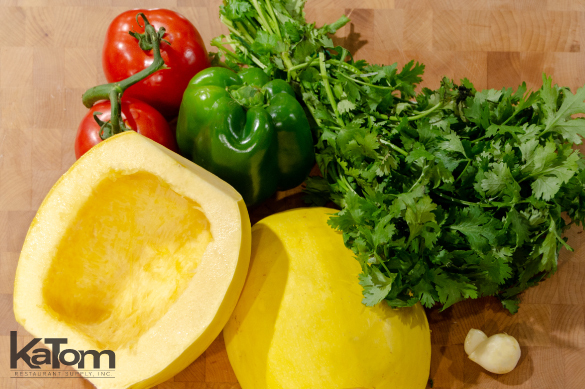 Many people assume prepping and cooking a squash is difficult, but the beauty of this easy spaghetti squash recipe is that the work actually happens in the oven with a steam bath. Once it cooks, the squash simply scrapes out with a fork and looks like spaghetti. To prep this dish, you only have to chop some vegetable and give the squash time to steam in the oven before tossing with the remaining ingredients. 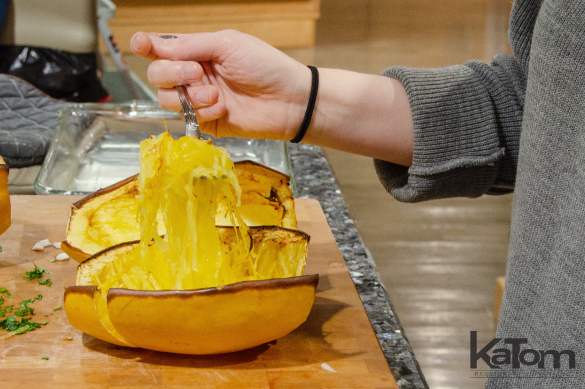 If you have kids in your house, cooking and scraping out the squash can be a terrific party trick. I once told a group of my daughter’s friends I could make spaghetti magically appear from that “weird-looking” squash on the counter. I was met with plenty of skepticism that promptly turned to amazement when the spaghetti magically scraped right out – and then they wasted no time eating this “magical” dish. I do enjoy this Santa Fe spaghetti squash for its ease of preparation and because it’s an inexpensive healthy meal that allows for substitutions. Although I prefer the black beans for color and texture, this easily works with pintos or kidney beans. I also tend to use any bell pepper I have on hand, along with mushrooms and chopped onion. 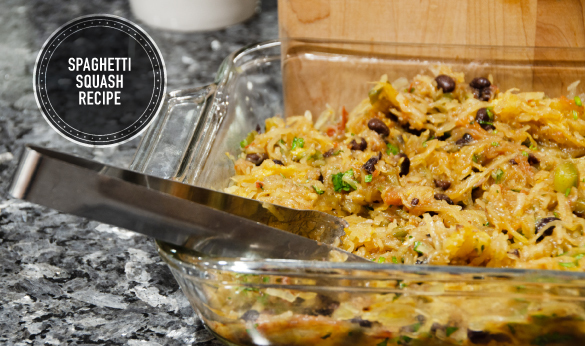 Whether you’re playing party tricks with kids or just in the mood for an easy vegetarian dish, this baked spaghetti squash will likely become a staple for your healthy dinner routines. Place squash halves in a shallow baking pan, centers up, in approximately 1 inch of water. Bake squash until soft, approximately 1 hour. Scrape flesh of the squash from the rind using a fork and place in a large serving bowl. Heat 1 tablespoon of oil in a large skillet over medium heat. Cook and stir the black beans, tomatoes, bell pepper, and garlic until the vegetables are soft and the liquid has reduced, about 10 minutes. Pour into the bowl with the squash and toss to combine. Add 1 tablespoon oil, vinegar, and cilantro, then toss again.